I'm very humbled to be involved in the Swimming for Katie Renz Blog Hop and Fundraiser! From October 10th thru October 12th, some of the best stampers are joining together to support and encourage our friend and fellow stamper, Katie Renz, who is currently battling inoperable gastric cancer. If you're not familiar with her, Katie’s cancer story started just before Christmas last year. This young, beautiful, healthy, vibrant mother of 3 with her infectious smile was suddenly diagnosed with an inoperable cancer, virtually overnight. A few tummy aches and then stage 4 gastric cancer. Her first post about it is here. The idea of “Swimming for Katie” came from her recent post here. The exclusive Keep Swimmng Clear Octopus stamp used on my card, was designed by Becky Oehlers and is available as a clear stamp with 100% of the profits going to Katie's Fund to help her and her young family. 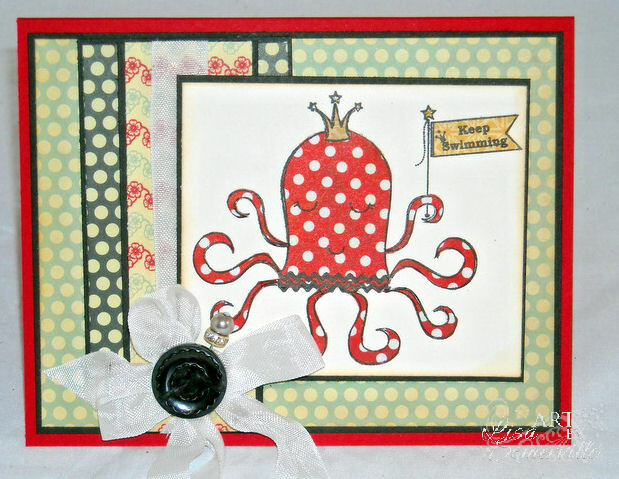 In addition to the Keep Swimming Octopus clear stamp, Marianne Walker and True Doodle Designs both have also donated digis that are for sale, you can view all items for sale at here. LOVE the paper piecing and all those scrumptious polka dot shades! Awesome, Lisa! I think it's wonderful what you gals are doing, God Bless you all. Lovely card, Lisa! This is such a wonderful thing to do for Katie! LOVE the polka dots--super cute card. What a great card for a great cause! This is so colorful and cheerful...and you have a beautiful heart, Lisa! Lisa - love your paper combos. Thank you so much for helping with this cause! LOVE LOVE LOVE IT!!!! Tfs!!!! Hugs and prayers her way!!!!!!!! Super cute, Lisa! I love the papers you picked! Thanks for spreading the word about this event! Love your polk a dot pus Lisa. Thank you for doing this for Katie! A dotty octopus! So cute! This is a very special blog hop - you guys are very special. The piecing of the octopus is so cute! love the bright and happy card. How wonderful that you and everyone is supporting Katie during this difficult time.